OCTA SemiPro Induction Unit for the Semi-Pro Kitchen. EGO Elektro-Gerate AG have developed the NEW SemiPro Induction for a wide spectrum of Semi Professional applications. The models available offer Touch Slide Control or Control Knob control and is designed with the unique bridge function. Click the image to the left to be taken to the OCTA page on our online shop!!! The OCTA SemiPro Induction System has been designed to offer 2 control options per Octagenal Heating Zone. The standard unit is supplied with the EGO Touch slide control, which offers the user a 0-9 Slide heat Zone Control, 3 built in Cook and Hold settings and the unique Bridge function, which allows the 2 zones to operate as one large heat zone. The alternative option of control is a simple Regulatory Control, with Control knob operation. The OCTA SemiPro is based on EGO's G5 Technology and is powered using 13Amp or 10Amp power supply. The Stand by function is in accordance with EC 1275/2005 Annex 2, with flex TC of K6: <0.5W (No Discharge or Shock). The OCTA SemiPro Induction System is approved to 10 000cycle hours and all Coils and Generators are VDE Approved. 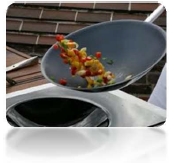 SemiPro Induction Wok System to according Wok Pan.